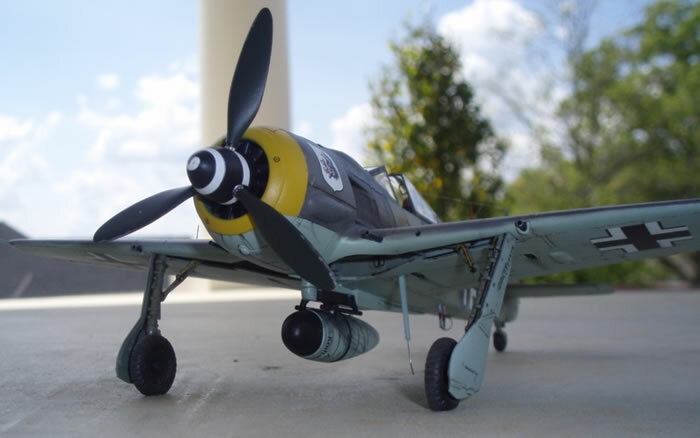 This is the Tamiya 1/48 Focke-Wulf Fw 190A8/R8 "Sturmbock" as flown by Uffz. 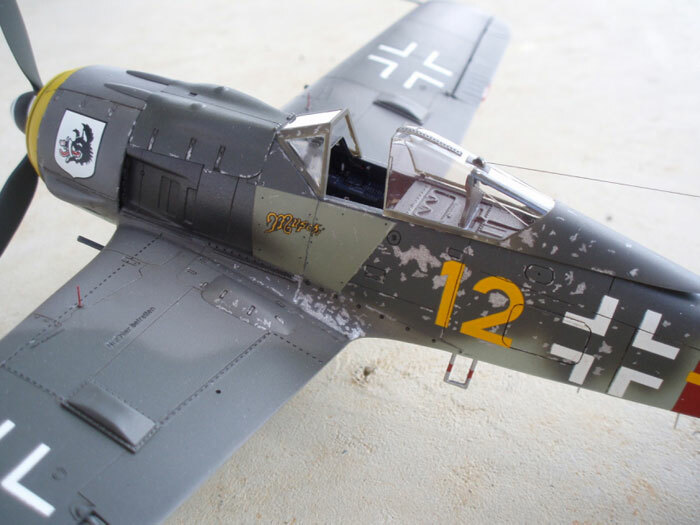 Paul Lixfeld of 6/II/JG300 in November of 1944. 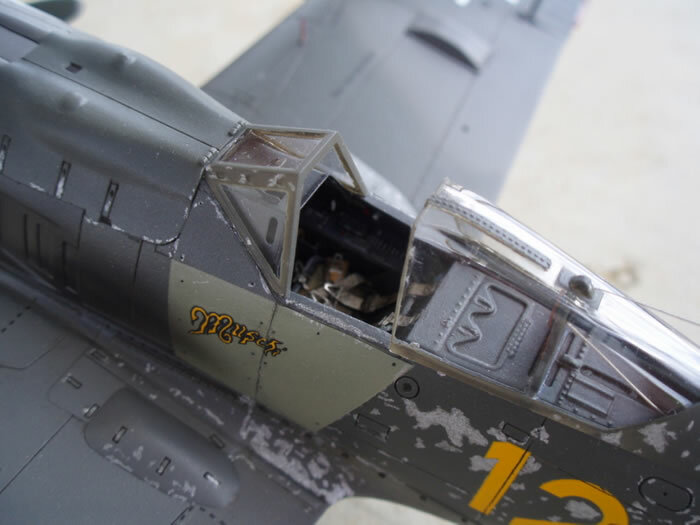 The Eduard photoetch "Zoom" set was used, as was Aeromaster decal sheet 48-686 and True Details resin wheels. 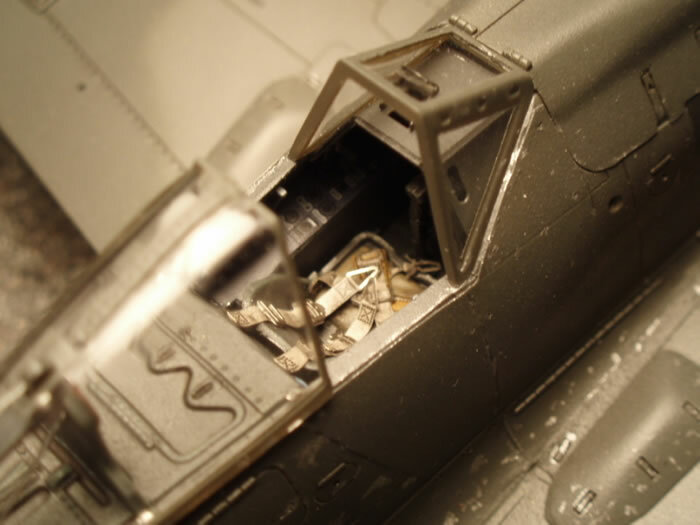 Various guages of wire were used to replicate the electrical cables for the main gear, tailwheel retraction wire, loop antenna, and pitot tube.Ê Small diameter brass tubing replaced the 20mm and 30mm kit barrels. 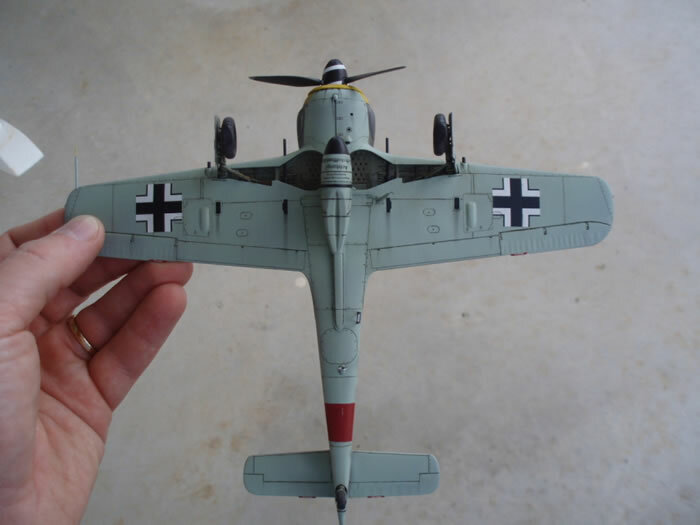 The model was painted using White Ensign Models RLM 74, 75, and 76. 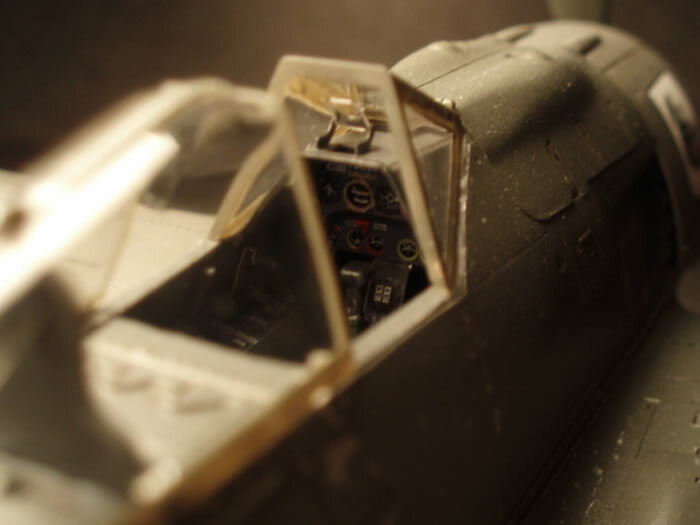 RLM 66 was used for the interior, RLM 04 for the cowl, and RLM 02 for the landing gear and unique armor plating near the cockpit left side (not sure who "Muschi" was.... wife? girlfriend?). 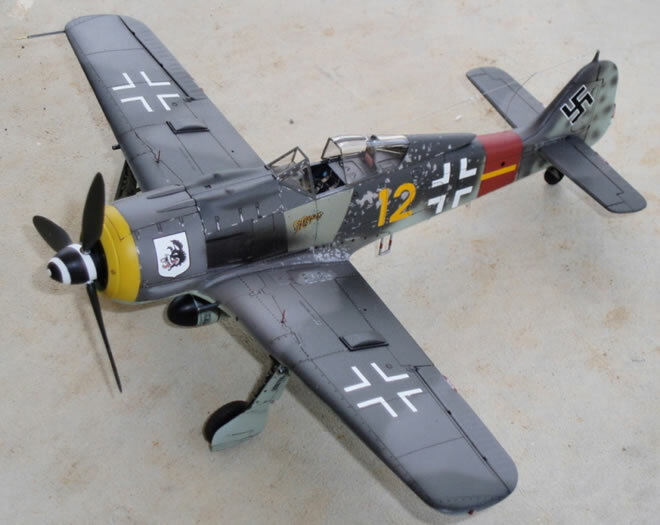 I've seen actual photos of this aircraft (only left side and close-up of cowl....reference JG300 website) and it definitely saw some hard use and was in need of a paint job. I replicated the chipping using Testors aluminum paint and a very fine tip brush. Exhaust stains were recreated using a black/brown mix of about 90% thinner, with some gray pastel chalk streaks once dry. Oil and fluid stains were done with thinned oil paints and the ejection port stains with some MiG pigments. 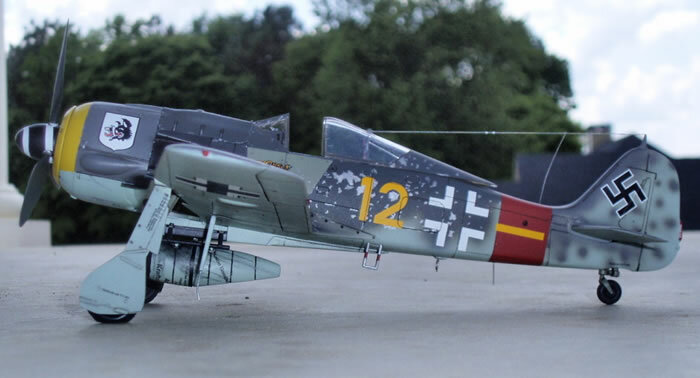 I really like the way Tamiya kits just "fall together."